Ukraine’s Carpathians are among the least explored mountains in Europe and offer spectacular views, traditional villages, and the friendliness of the Hutsul and Boyko people. This walking holiday will take you through the highlights of Ukrainian Carpathians, including three mountain ranges – Gorgany Nature Reserve, Svydovets range and Chornohora range. 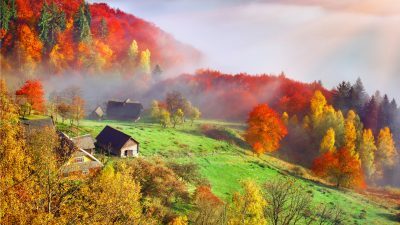 Ukraine’s Carpathians are among the least explored mountains in Europe and offer spectacular views, traditional villages, and the friendliness of the Hutsul people. Where Do our Walking Holidays in Ukraine Take Place? Our Ukraine walking holidays will take you to the hidden gems of the Ukrainian Carpathians, including three distinct mountain ranges – Gorgany, Svydovets and Chornohora, which are all part of the UNESCO-listed Carpathian Biosphere Reserve. Gorgany (Ukrainian: Ґорґани) is a mountain range in Western Ukraine, close to the Chornohora range. The highest peak of Gorgany is Syvulia (1,836 m) with the other high peaks including Ihrovyshche, Vysoka and Grofa. The mountains are made of flysch rock, mostly sandstone, which create typical for Gorgany debris fields (gorgans). Gorgany is the least populated part of the Ukrainian Carpathians, inhabited by the Boykos, whose primary occupation is herding. The Svydovets Range is located in Western Ukraine, between the Eastern Beskids and the Ukrainian Carpathians. Svydovets hosts one of the ten Primeval Beech Forests of the Carpathians recognised as a UNESCO World Heritage Site in 2007. The highest peak is Blysnyzi (1,883 m). Chornohora (literally: Black Mountain) is the highest mountain range in Western Ukraine. The range is located on the border between Ivano-Frankivsk and Zakarpattia oblasts. The highest peak of Chornohora is Hoverla (2,062 m) with other high peaks including Pip Ivan (2,022 m) and Petros (2,020 m). The mountains are made of flysch rock. The range forms the watershed between the Prut and Tysa River. The lower parts of Chornohora are inhabited by Hutsuls, whose primary occupation is herding.